Perfectionism and procrastination sound like opposites but are they really? Do you set incredibly high standards for a project including lots of planning and then don’t get started because it won’t be completed to your satisfaction? Do you put off a project, thinking you will have more time or energy to do it later? More often than you think, perfectionism can be immobilizing you. 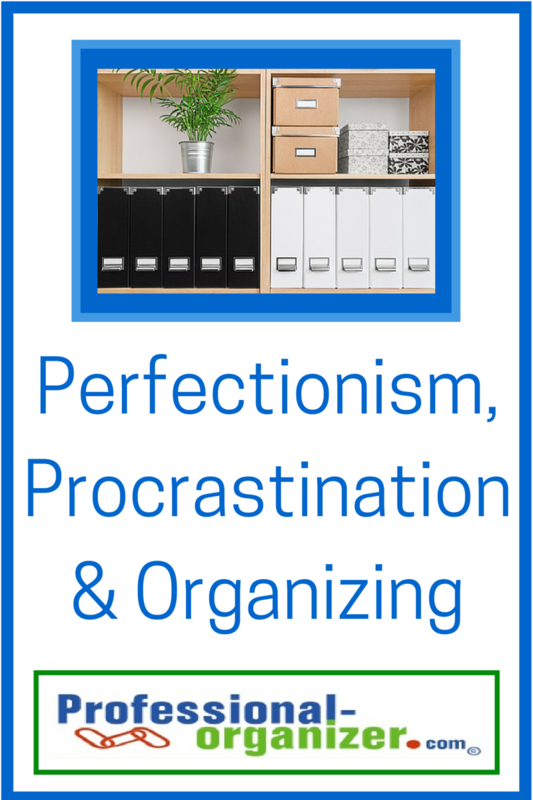 Here are some points to think about with perfectionism, procrastination and organizing. Begin by becoming aware of perfectionism in your life. Many people do not realize that they are perfectionists. A home with clutter or incomplete projects can be the home of a perfectionist! Having incredibly high standards that are impossible to reach, whether in taking care of your home, completing a project, or in any thought process, indicate perfectionism. By having the realization of perfectionism, you can begin to evaluate what this is costing you and what’s next. Because perfectionism is stopping us from starting, we need to focus on the goals of balance and completion. Simply put, it is that old saying, “If I can’t do it right I am not going to do it at all.” Start by asking yourself, what is “right” to you? A realistic goal balances your personal energy, time and importance of the task. You can do it well and get it done. Donna Smallin, author of Organizing Plain and Simple, notes that “done is perfect.” You can start by using Donna’s saying to help you put things in perspective, create the balance for yourself and get the job done. Another aspect of perfectionism is rigid, black and white thinking. Either a project is perfect or a disaster! Using acknowledging, empowering self talk, including kudos of accomplishment throughout the project, leads to satisfaction with the outcome and completion. Seeing productivity, you will feel successful and feel more like completing the project. It is definitely a circle of work and success that stands out then. We may think that a project is going to take hours and we may not have hours to work on it. It may surprise you how much less time a project takes than we imagined. We may not start a project until everything else is perfect around it. Break the tasks into manageable parts. Make it manageable with one or two hour time slots, only taking out a part of the project, or adding in additional resources. As you work through your project, commit by writing in your calendar slots that take advantage of your best energy times. You will feel successful as you move forward, instead of putting off and procrastinating. Standards of excellence instead of perfection make a difference in starting and completing a project. Whether organizing a space or any other task, start with baby steps and practice your imperfection. Work at a comfortable pace, allow for changes as needed and review your work consistently. When others offer to assist, welcome their help and disregard their imperfections as they help you complete a project. With this process, you will be excited by the excellence you created! Want more organizing motivation and inspiration? Join my newsletter. I just read a post by Cameron Gott and like you, he mentioned focusing on “good enough,” excellence, but not perfection. When we set the bar too high (impossibly high) we end up paralyzed or fall into that negative self talk. Using a different approach and perspective can make an huge difference to motivate us past procrastinating. Thanks for sharing here. I love Cam’s idea of “good enough”. It’ helps us get started on any project and know when we are finished too.